THE boss of Fiat Chrysler Australia has some nice choices across the showrooms. With the likes of Alfa Romeo, Jeep, Fiat, Dodge and Chrysler brands coming under the portfolio, Veronica Johns' choice of chariot literally comes with a sting in the tail. 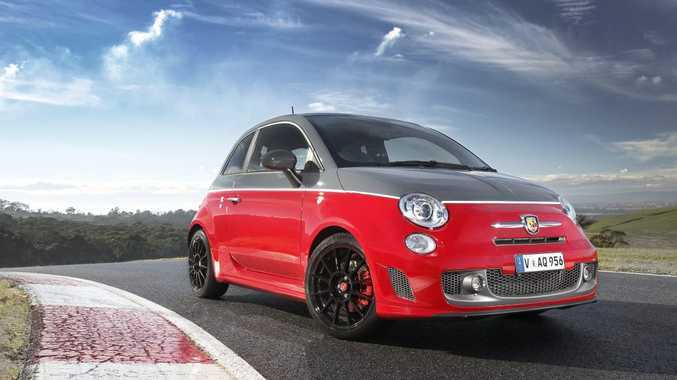 She has cast aside the Fiat 500 Gucci in favour of a fire-breather from Abarth. These are the race-tuned versions of the bambino, giving some serious bite to the cutesy pint-sizer. As part of the refreshed Fiat 500 range, the new Abarth 595 line-up comes with more power and extra equipment. Available in two trim levels, Turismo and Competizione, pricing is sharper starting from $33,500. After getting behind the wheel, the petite proportions are quickly forgotten with a throaty exhaust tune and sporty suspension set-up. You feel the bumps with a stiff ride, although the trade-off is revealed when you put it to the test. The turbocharged four-cylinder T-Jet engine really gets the little Abarths firing and slings it out of corners with ease. Road noise is pretty good considering how low you are to the ground and the limited metal around the passengers, and there is a nice exhaust note under power. Well-weighted steering provides a go-kart-like feel, it's a blast to pilot in town and on the highway. The cabin is a step up from the 500 with a particularly sporting feel. The figure-hugging seats are the biggest indicator of its intentions, along with the turbo boost gauge which is a dash add-on. The 595 Turismo has leather seats, diamond-finish 10-spoke 17-inch alloys, cross drilled and self-ventilating front brake discs with red brake callipers and Koni front suspension. Competizione hardtop and convertible have a more race-focussed specification, with fabric Sabelt bucket seats, five-spoke 17-inch alloys as well as the dual mode 'Record Monza' exhaust which opens at 4000rpm for an ever better tune. Both models also get the new 17.7cm colour driver's instrument display and a Bluetooth phone capable system. Abarth has an esteeming motorsport history. Back in the 1920s, motor mechanic Karl Abarth rapidly made a name for himself after filling in for an injured rider in the qualifiers for the Austrian Motorcycle Grand Prix, setting the best time and beating the world's greatest riders. Later racing sidecars, he became world renowned for his ability. But it wasn't until 1949 that he turned his hand to modifying existing cars after racing became too expensive. He designed a kit for the gearbox and tailpipes of the Fiat Topolino. The kit was an enormous success, allowing anyone to transform their Topolino into a faster, more exciting car. Abarth was born. Details: Three-door front-wheel drive performance hatch or convertible. Engine: 1.4-litre turbocharged four-cylinder generating maximum power of 118kW @ 5500rpm and peak torque of 230Nm @ 3000rpm. Transmissions: Five-speed manual or five-speed automatic. Consumption: 5.4 litres/100km (combined average, manual); 5.3L/100km (a). CO2: 155g/km (m); 150g/km (a). Performance: 0-100kmh in 7.4 seconds; 7.6 (a). Bottom line: Turismo $33,500, Turismo (a) $35,500, Competizione $36,500, Competizione (a) $38,500, Competizione convertible $39,000, Competizione convertible (a) $41,000.